At Bush Kidz Blacksoil, we believe in nurturing children’s development through a range of natural experiences and interactions. We believe that children learn best through play where they have the opportunity to grow and challenge themselves in an environment where the overwhelming focus is on enjoyment. We offer this to all the children at our Blacksoil childcare centre. We are fortunate to have such a beautiful natural area for our childcare facilities and provide a rich and exciting environment for your child to play and learn amongst. We also cater the learning and play experience to your child’s needs – so if your child has a particular desire to learn about gardening, farming, or animals we will encourage and nurture this in a positive and safe way. Baby animals and small children are so precious to each other – each at a beautiful early developmental stage, and eager to engage with the natural world around them. We harness this natural curiosity and provide a warm animal-focused environment for children to interact with animals and to learn about their place in the natural world. Children will have the opportunity to care for and learn about farm animals and what they mean to us. Children will be able to assist staff in feeding, grooming, and cleaning pens. Each day the children head outside to visit the cows we have at our Blacksoil childcare facility. During their visit, every child is encouraged to take care of and feed our cows on a daily basis. The children take part in all the basic tasks required to feed and care for the cows including – preparing bottles for the cows, cleaning water buckets and pens and giving the cow lucerne and oats. Our junior farmers program wouldn’t be complete without chickens. Each day the children visit our three chickens (Gene, Dotty and Hen Solo), where they take care of and feed them on a daily basis. The children are also taught to recycle their food scraps to give to the chickens an extra food source. Along with our farm animals, occasionally we also have colourful birds and butterflies visiting our centre, which is a joyful experience for the kids when they get the chance to see them. We also have an extensive worm farming and composting program in place that we also teach the kids about. Both of these programs are used to help the wide array plants on our premises to flourish and grow. There are so many ways your kids can benefit from the junior farmers program. Not only does the program provide your children with rich and practical life experiences, but it also offers the rare opportunity for them to really experience and be part of nature. Demonstrate a sense of belonging and comfort in their environment by incorporating aspects of their home life into the learning environment. Build on their own social experiences to explore other ways of being; children are provided with social experiences where they can discover a way of life that is different from their own – Farming. Cooperate with others and negotiate roles and relationships in group experiences by promoting teamwork. Ultimately the junior farmers program is all about nurturing an appreciation and understanding of nature and animals in children. We hope your children learn and enjoy the experience as much as we love to offer it. 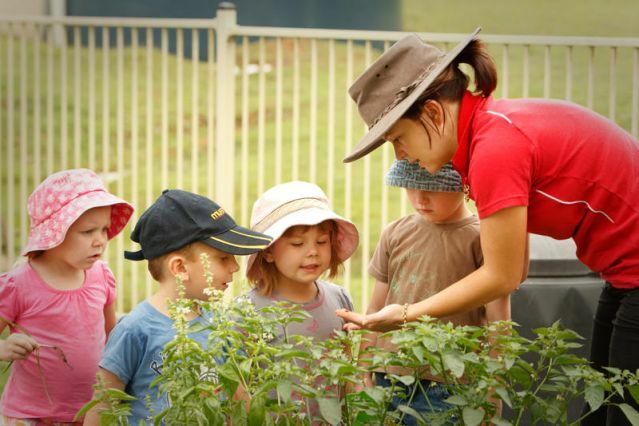 If you would like to learn more about our junior farmers program or if you would like to come down and see our junior farmers program in action for yourself, please call our childcare centre in Blacksoil on (07) 3201 4231. We would love to meet you and your family.